Tipard iPod Converter Suite packs iPod Video Converter, DVD to iPod Converter and iPod to PC Transfer. It can help you rip DVD and convert popular videos to iPod formats. Besides, it can support English/French/German/Japanese four interface languages. And now it highly supports iPhone 5s/5c, iPod Touch 5, iPad mini 2, iPad Air, iPad mini 2, Microsoft Surface, Samsung Galaxy and iPod Nano 7. Tipard iPod Converter Suite can help you rip DVD movies to iPod video format on multifarious iPod devices, like iPod, iPod nano 4, iPod nano 7, iPod touch, iPod touch 2, iPod touch 4, iPod touch 5, iPod classic, iPod shuffle, iPhone 5s/5c, iPhone 5, iPhone 4S, iPhone 4, iPad mini 2, iPad Air and iPad 4, etc. 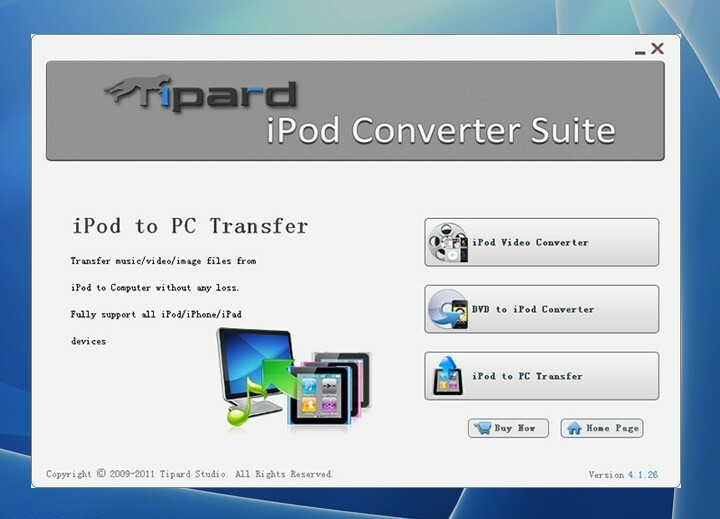 Tipard iPod Converter Suite allows you to convert multiform video files and audio files to iPod. This iPod Converter Suite can transfer music/video/image from iPod to computer and it can help you backup iPod video, audio files to PC, then you could transfer the video, music to another iPod or iPhone. You can crop the video frame to remove the unwanted playing areas and the black edges to fit your player's screen. Besides, it can watermark your video in the form of a text or image. What's more, you can set its position and transpacency and Trim any segment of a video and join several pieces together as a single one. You can adjust the video brightness, saturation and contrast. Besides, you can convert an interlaced video effect through the function of "Deinterlacing". Tipard iPod Converter Suite can help users choose the subtitles and audio tracks of the DVD and video. It only takes a short while to complete the conversion and the initial interface makes it pretty easy to use. 2014-05-30 6.3.32 Highly compatible with iPhone 5s/iPhone 5c, iPad Air, iPad mini 2 and iOS 7 now.